Tony Mateo from Spain! 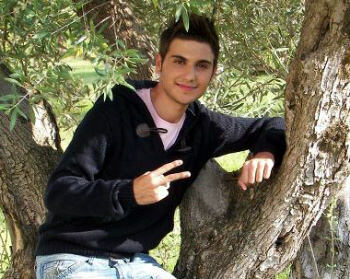 Tony is the older brother of Abraham Mateo! Fantastic young adult singer, and actor! Tony Mateo was born in San Fernando (Cádiz), an Andalusian city located in the southwest corner of Spain. His grandpa has been active as tenor soloist with a choir for over 50 years while his mother sings Boleros and Spanish music. Tony showed a keen interest for singing and performing from an early age. It all started when he was six years old. Tony watched the reality show “Operación Triunfo”, the Spanish version of American Idol. Every time David Bustamante, one of the contestants, went on stage, Tony would tell his mother that he would like to be like David one day. Soon after, his mother began to coach him, correcting his singing technique and presenting him with music that matched his vocal range. He and his younger brother Abraham (who was featured here only a few weeks ago) frequently sang at home as though they were in a competition and their parents played the jury. “It was all too much for me because I’d never been on stage nor on television before, but I lived and enjoyed it so intensively and it made me realize what I wanted for my life: music”. “that competition gave me so many emotions and dreams, it was my beginning in music, where everything started for me, and what inspired and motivated me to become a singer”.